John Latour’s research focuses on artists using pseudonyms or alter egos in their work. Who was who was who in Canadian contemporary art? John Latour is a practicing visual artist and the Teaching & Research Librarian – Fine Arts at Concordia University. He was also an art librarian at BAnQ (2016-2017) and at Artexte (2005-2015). John holds a BFA in Studio Arts (University of Ottawa), a Master of Library & Information Studies degree (McGill University) and a MA in Art History (Concordia University). HB Having worked as a librarian at Artexte for ten years, you have extensive knowledge of the collection. I’m curious about what sparked your interest to return to the collection as a researcher. How does your past experience inform your present work? Do your two personas, librarian and researcher, ever dialog in the process? JL It’s because I worked at Artexte for 10 years that I really appreciate how deep the collection runs in terms of its subject coverage of contemporary and Canadian art; and how much material there is still for me to discover. My current research looks into artists who create artwork through personas or under pseudonyms. Of course, these artistic strategies are not unique to Canadian art; but there is a rich tradition of Canadian artists who use personas and pseudonyms in their practice. As an art student, I was fascinated to learn about Dr. and Lady Brute 1 (2018). Dossier 410 - Craig, Kate [+ Bull, Hank]. 2 (2018). Dossier 410 - Metcalfe, Eric., Mr. Peanut 3 (2018). Dossier 410 - Trasov, Vincent. and Anna Banana 4 (2018). Dossier 410 - Banana, Anna. in my classes; and these figures took on an almost mythic quality in my own understanding of Canadian Art History. Years later, I realized there were more personas and pseudonyms at play than I ever imagined, including those by newer generations of artists; but I could find no publication that tries to look at them collectively. One of the goals for my residency at Artexte is to publish a hybrid artist’s book and biographical dictionary of artists and their alter-egos. Another reason for wanting to come back to Artexte was because I knew the collection had very likely changed since my departure. I’m sure the Artexte Library that exists in my head is now different from the physical one that I’m consulting because the tangible collection grows and changes all the time. Throughout my residency, for example, a number of Artexte staff brought to my attention the names of artists or titles related to my project that were all new to me. Most people I know in the arts wear at least two hats. In my case, I’m fortunate that my librarian and artist / researcher practices complement each other. As an artist, I’m often inspired by other people’s art as well as by writings about art. As a librarian, I’m constantly trying to stay informed about diverse visual practices, and facilitating research in the arts. HB What is it about art documentation that enriches or feeds your research? JL Sometimes the documentation about a work of art, an art event or an activity is the only trace that you have of the original source. One of the things that I came to appreciate at Artexte was the importance of artists documenting their own art practice for the future. More often than not, the documentation you find in an art publication, a website or an artists’ file is incomplete or fragmentary; or the original artwork does not lend itself easily to representation in other media, such as performance. In these cases, art documentation becomes pieces of a larger puzzle. This makes research equally challenging, frustrating and rewarding. Now more than ever, I appreciate the value of research data in the visual arts (by the way, this is my art librarian persona talking). If for example, we think of a painting as a finished work of art, then we could consider a sketch made in preparation for the painting as research data. For a sculptor, research data could be the paper maquettes made before finalizing the finished sculpture in metal, etc. Visual artists carry out research all the time, and it takes different forms; but we don’t necessarily have the instinct or habit to capture this process. I think researchers would love to have access to this evolution of ideas. HB What is the most surprising thing you’ve experienced or discovered during this residency? JL In the back of my mind, I knew that many of the early artists who created work through personas or under pseudonyms were often linked to either mail art networks or performance art communities, but the overlap between the two only really became evident as I began to read up on artists such as Eric Metcalfe 2 (2018). Dossier 410 - Metcalfe, Eric., Kate Craig 1 (2018). Dossier 410 - Craig, Kate [+ Bull, Hank]., Anna Banana 4 (2018). Dossier 410 - Banana, Anna. and Vincent Trasov 3 (2018). Dossier 410 - Trasov, Vincent.. Satire was also something many of these artists share. For those artists who came after, their use of personas and pseudonyms is largely done under different contexts and for different reasons. 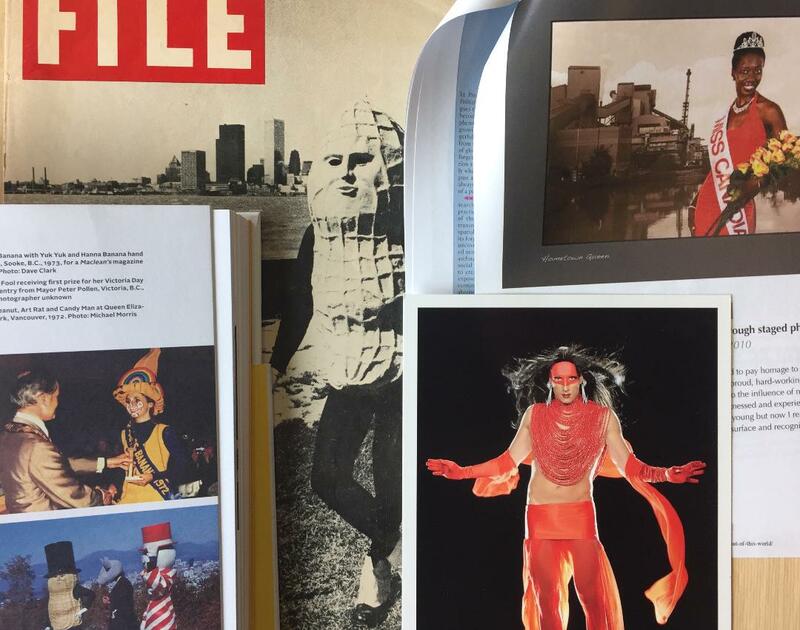 Through my communications with artists during this research, I’ve learned that that an intergenerational effect can also happen – artists who have used personas or pseudonyms in their own work in the 80s, for example, have taught younger artists who also use alter-egos. It is also interesting (for me at least) to think how the Internet has had an impact on our sense of art networking and community. HB What is something you think belongs in the collection that you didn’t find? JL This is a difficult question to answer as I think the collection is both comprehensive in its coverage of contemporary Canadian art and well represented in e-artexte, Artexte’s library catalogue and digital repository. I do know that Artexte’s artists’ files contain a goldmine of art documentation such as printed ephemera including exhibition announcements, artists’ statements, etc., and unpublished materials such as slides and video documentation – all of which remain undocumented in e-artexte because of practical (i.e. financial and human resources) and legal (i.e. copyright) reasons. Artexte is not alone in this situation. So if I may, I’d like to change the question to “What is something you would like to see in relation to the collection that is currently missing.” My response to this would be to have the policies, resources and systems in place to enable Artexte to work in collaboration with artists towards digitizing all of this amazing, untapped art documentation – and making it openly accessible to the public. John would like to thank both Artexte and Concordia Library for their generous support of his research residency.